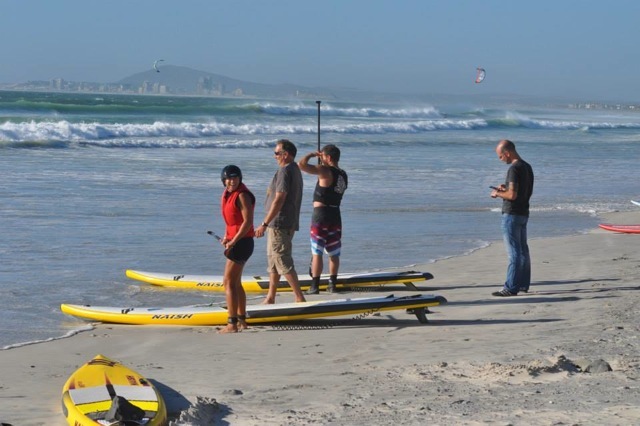 As was forecast, conditions peaked properly for the 2nd race in the 2014 PRIMI Naish Downwind Dash Series here in Cape Town, South Africa. 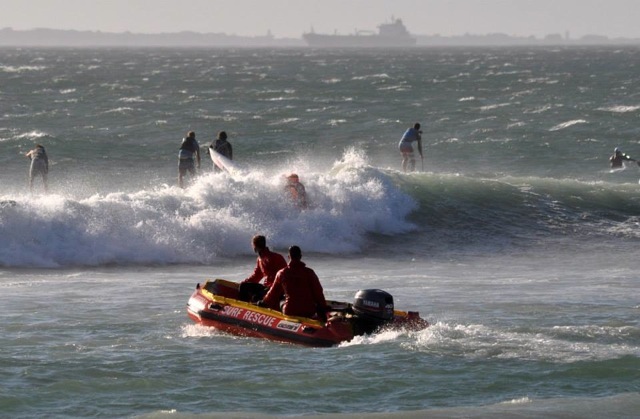 Swell at 3.5 meters and 17 seconds had most of the fleet dreading hopping in the water at Milnerton Lighthouse and especially dodging the rocks at the exit in Big Bay. 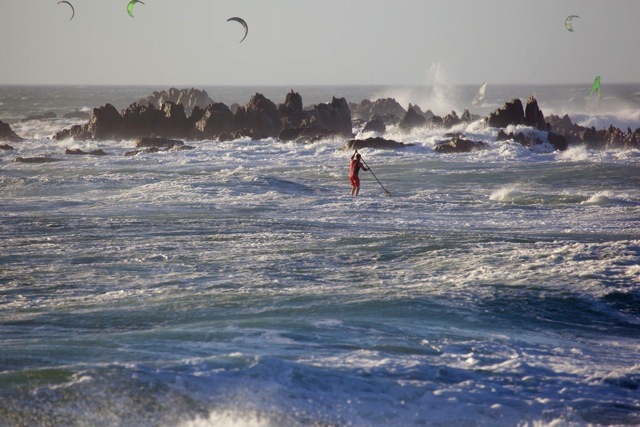 The wind was a pretty standard 22-30knots whipping up beautiful runners for the entire 10 km downwind run. 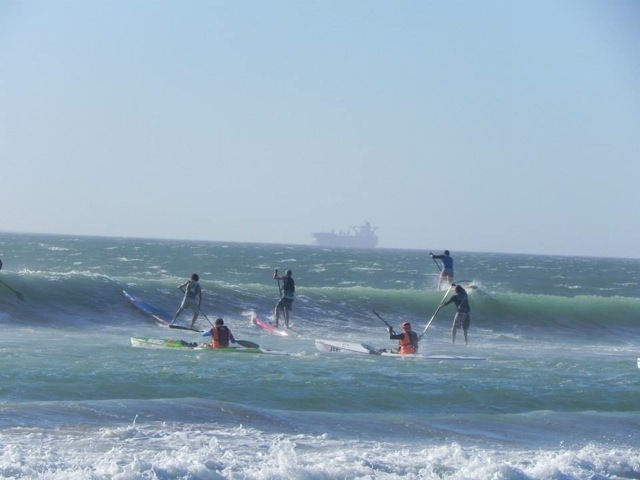 With conditions looking a little ominous, the field had been whittled down to 27 of the more experienced paddlers. Race organiser, Richard Kohler, delayed the first start to try and avoid the worst of sets and this worked in part, as the paddlers who had lined up on the left got a free run to the back, though the paddlers on the right got caught in a nasty mid-break section which had dutch visitor Emma Reijmerink and local Brigette van Aswegen sharing dunkings en masse. Miskha Steyn and Monica Wohlgemuth got out relatively unscathed and set off down the course at great speed. Second start is exactly 10 minutes after the first, which means there is no guessing whether this will coincide with a monster set or not. Luckily there was a minor gap and all but Chris Howell got through unscathed. Chris stuck the rudder on his SIC Bullet in the sand and promptly broke it off – end of race for him. This time round the right hand side of the start-line was the lucky choice as Greg Bertish hit the backline first with an immediate lead. Ivan van Vuuren, Dylan Frick and Ethan Koopmans all chose the left side, and despite getting out cleanly, now had a 200m deficit on Greg. 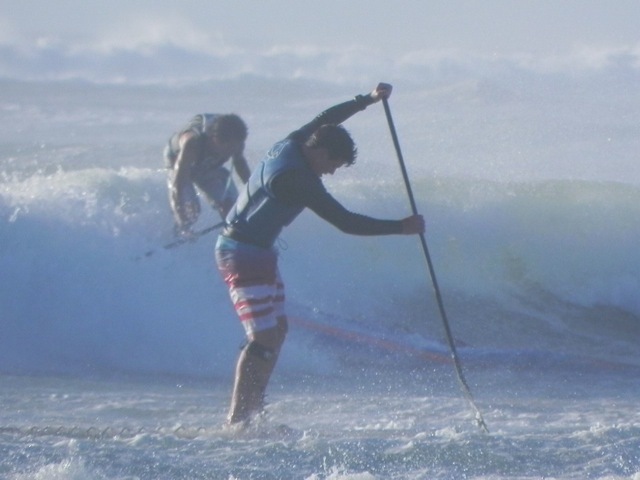 Ethan Koopmans showed particular determination in closing down Greg whilst Dylan was, as always, paddling like his life depended on it. The two youngsters caught up to Greg quite quickly but then Greg was loving the conditions and managed to stay with them for most of the way. Only Ethan managed to sneak ahead slightly before the great lottery of coming in through Small Bay. 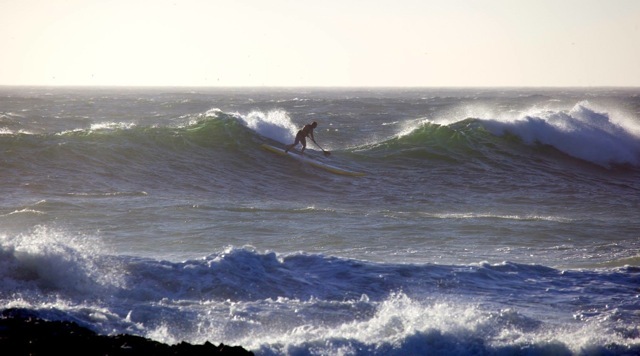 On a day with big swell like this, Small Bay can literally make or break your race. 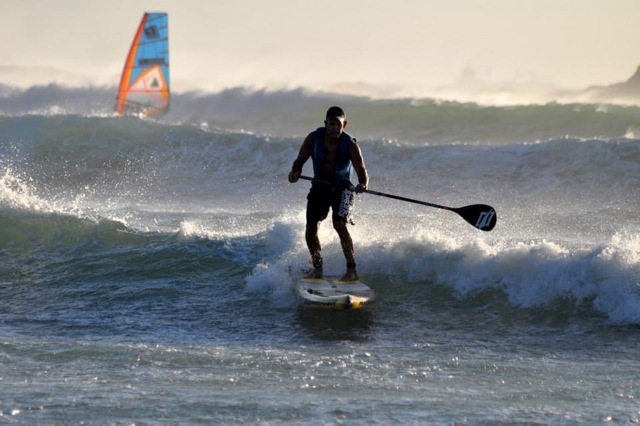 It is the shorter, hence quicker route to the finish, but if you get caught in a set you risk losing time, breaking your board or both. 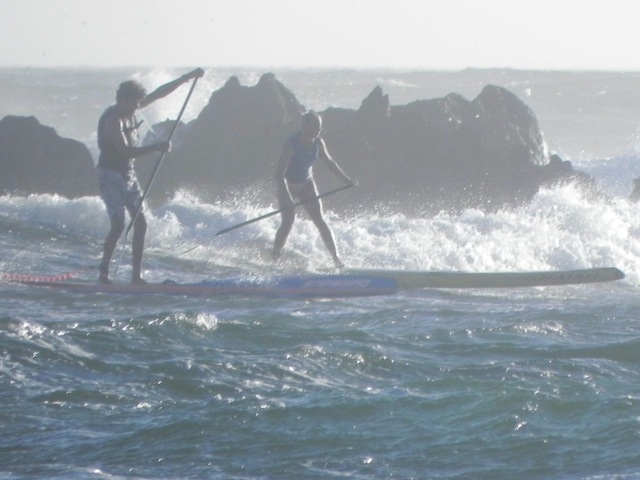 For this reason several paddlers, including Greg, chose option number two around the Small Bay rocks and hoping for a wave from the back straight to the Big Bay finish-line. 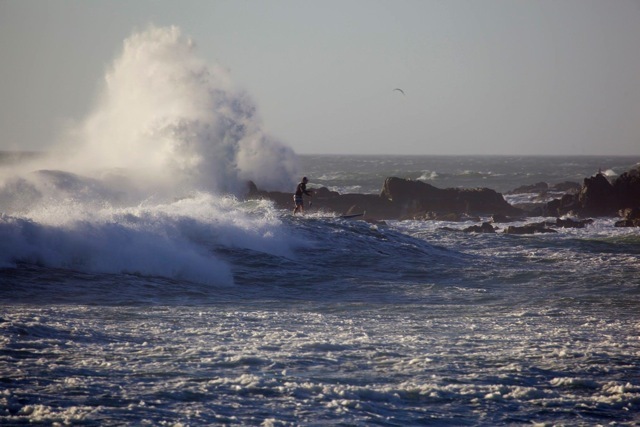 Waves are even bigger here but at least you’ve turned and can take off down the wave, whereas in Small Bay you are virtually paddling parallel to the swell (making take-off mighty difficult at that size). Ethan got through Small Bay beautifully and seemed unstoppable, whizzing across “Scissors” into Big Bay and immediately caught a left which was taking him to a supposedly comfortable win. 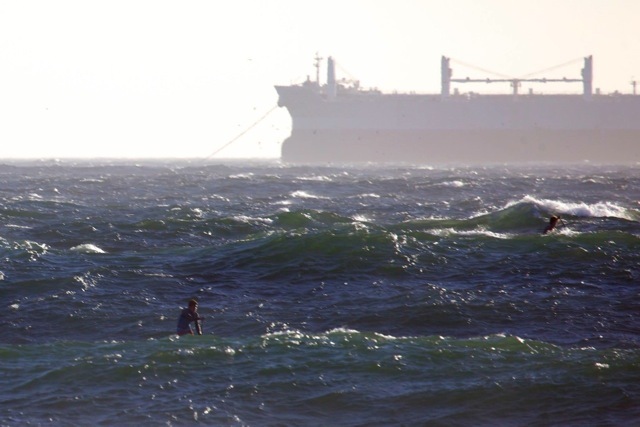 Dylan Frick was second into Big Bay and chose to paddle out deeper to catch a wave that would take him all the way to the finish line. 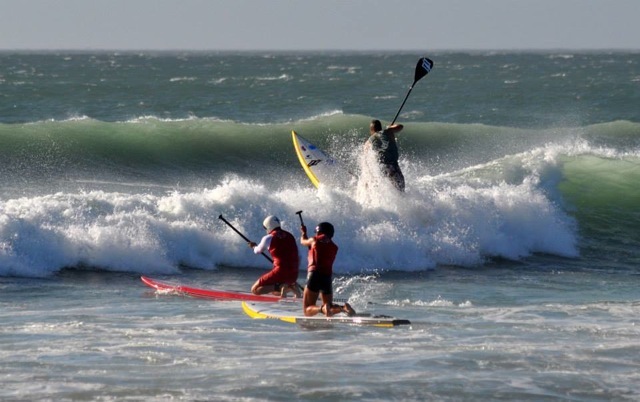 Great battle between these two athletes but hats off to Greg who stuck with them the entire way only to lose out by getting stuck with a monster set approaching and having to paddle back out against the swells and selecting entry option number two. 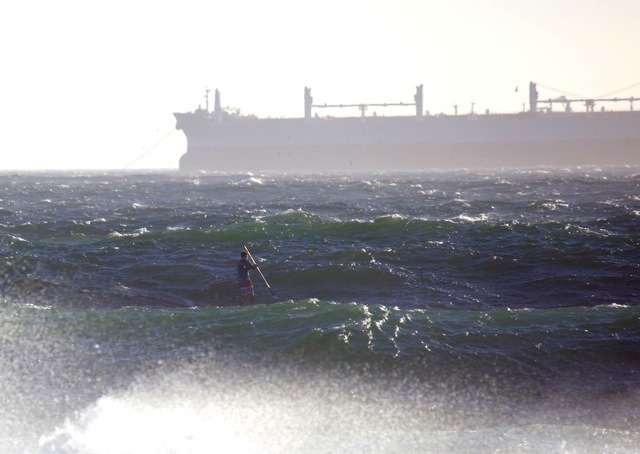 This allowed up and coming Tom King to sneak ahead into Big Bay whilst Ivan van Vuuren had stayed in contact as well. Tom King went on to take a fine third while Ivan negotiated a big one in Small Bay but somehow managed to keep it together and then caught a small ripple on the inside of “Scissors” which shot him through to the finish. As he put foot to sand he saw a dejected Greg semi-jogging to the finish – again it was a case of it ain’t over till it’s over and Ivan put on the gas and blitzed past Greg to take 4th. Greg went from being in contention for the win to settling for a still respectable 5th. Mishka Steyn pretty much nailed the win when her two closest competitors where sharing dunkings at the start making it two in a row – well done Mishka. Brigette edged out Emma for 2nd, while Patricia Kohrs returned victorious in the Ladies Masters division coming in ahead of Monika Wohlgemuth. These ladies never hold back and it’s amazing to see their guts and determination on a day like this – even more well done! In the Mens Masters Ivan’s 4th overall gave him the win ahead of myself and Armien Wohlgemuth. Ethan took out the Juniors ahead of Kimon dos Santos who also took a magnificient line into Big Bay to pass a couple of elder statesmen to take 6th overall. Joshua Robertson was third Junior a little further back. Another notable mention goes to previous Kite-speed World record holder Sebastien Cattelan from France, who came in only 10 minutes after the winner on an inflatable! 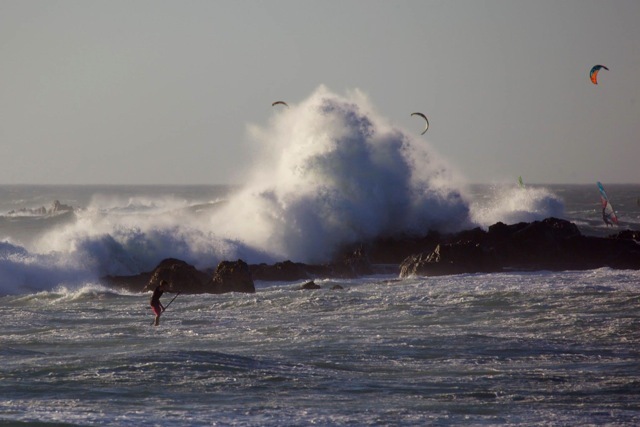 Inflatables suffer in rough conditions like this but Seb made seasoned paddlers sweat all the way! Dylan now has two wins from two races with Ethan having his work cut out for him to take the championship off Dylan with 5 more races to go. 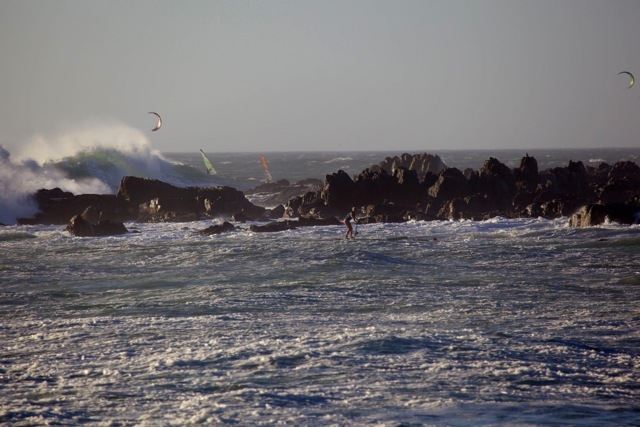 Forecast for next Wednesday is looking similar with another swell hitting just in time for race!